Designed for rapid, efficient, column-free extraction of PCR-ready DNA from C. elegans. 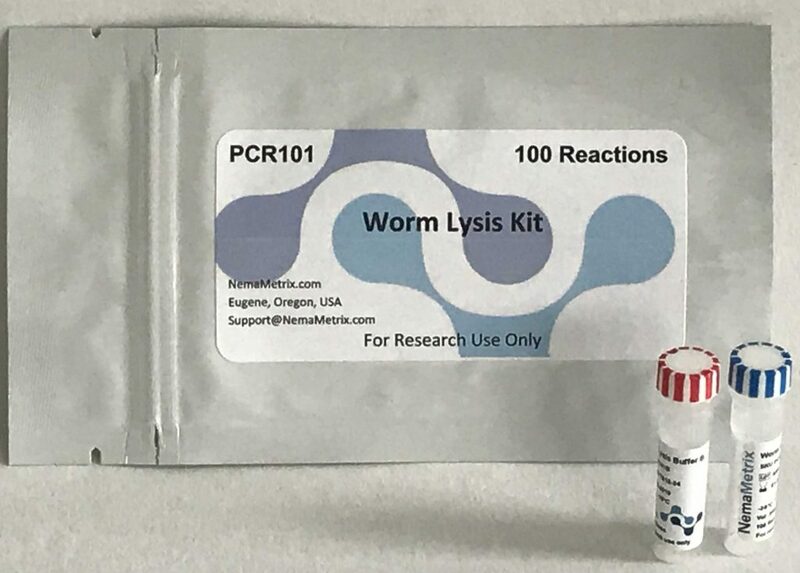 Traditional extraction methods take 2 hours, the Worm Lysis Kit requires only a 15-minute incubation before the DNA is ready for use directly in your PCR. DNA extraction is performed in a single tube without multiple washing steps to reduce potential contamination and sample loss and allows for quality DNA templates to be obtained consistently from single or multiple worm lysis reactions. ● Run multiple PCRs from a single lysis reaction. ● Each lysis reaction results in 100 uL of PCR-ready DNA and only 2 uL is required per PCR. ● Works well with as little as one worm per reaction or several worms. ● Amplicons of 3kb can be obtained by PCR, when DNA template is obtained from our lysis protocol. ● The DNA generated with the Worm Lysis Kit is suitable for use in all downstream PCR and qPCR applications without further clean-up steps. It can also be stored at -20°C for future use. PCR amplification from single worm lysate. Single worms were picked into 10 µl of Worm Lysis Buffer. After the lysis protocol the samples were diluted 10-fold and used in a PCR reaction with the NemaMetrix PCR Mix. - Avoid prolonged exposure to light. - The kit can go through 30 freeze/thaw cycles with no loss of activity.